The Cumberland & Dumfriesshire Farmers Mart had forward 681 head of ewes with lambs at foot at their sale at Longtown on Tuesday 21st June, 2011. Again a nice entry, trade excellent. Ewes with singles to £150 for a Beltex ewe from Whitehill Cottage; Texel £81 Colte Coates, £75 South Mains; Suffolk £75 Bayles, £73 South Mains, £72 Colte Coates; Greyface £70 Bayles; Blackface £66 Roddymoor; Hill Cheviot £58 Bayles, £54.50 South Mains. Ewes with twins to £110 for Beltex from Whitehill Cottage; Texel £74 Bayles; Greyface £63.50 Bayles, £62 Colte Coates; Charollais £62 Bayles; Masham £62 Bayles; Blackface £52.50 Roddymoor. Shearlings with twins to £72.50 for Greyface from Bayles. Shearlings with singles to £53 for Blackface from Bayles. Hoggs with singles to £88 and £86 for Greyface from Bayles; Texel £88 Roddymoor. Hoggs with twins to £70 for Greyface from Bayles. Store hoggs to £81 Roddymoor. 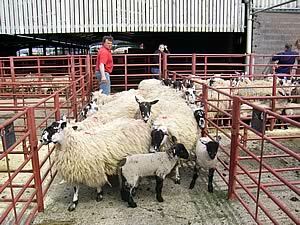 Store lambs to £52 Bayles. Cast ewes to £70 Bayles. Cast rams to £88 Clerkleap.